Planet Nine is a factor of ~2 smaller in all quantities compared to what we reported in the original paper. The new estimate of the semi-major axis is a~400-500AU (could potentially be even smaller, but only marginally so). 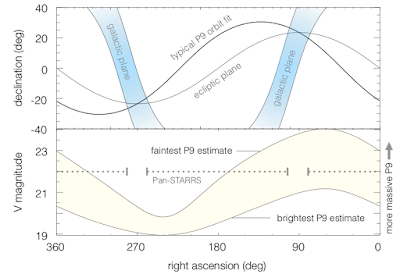 P9’s orbital eccentricity is about e~0.15-0.3. The inclination is around i~20 deg. Last but not least, the mass is about m~5 Earth masses. Planet Nine is probably not a relative of Neptune — it’s a Super-Earth. Now let’s dig into the details a bit. 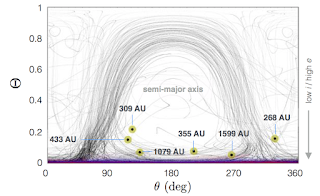 Generally, the distant KBOs span a broad array of perihelion distances, ranging from ~35AU to ~80AU. As a result, some KBOs interact with Neptune (which lives at 30AU) much more strongly than others, yielding a wide spread in dynamical lifetimes. 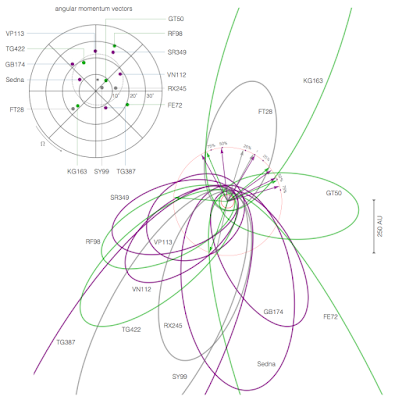 For the purposes of the P9 hypothesis, it is useful to sub-divide the data into three categories: stable, metastable, and unstable orbits, which are shown on the above plot as purple, gray, and green ellipses respectively. Although the orbital confinement among the plotted long-period KBOs is easy to see by eye, it is also evident that the degree of clustering is far more striking among dynamically stable (purple) and metastable (gray) orbits than their unstable (green) counterparts. Intuitively, the weaker clustering of unstable orbits is easy to understand — KBOs that interact with Neptune most strongly experience relatively rapid dynamical chaos. In turn, these stochastic perturbations erase any innate orbital structure of the distant belt. While all KBOs tell some story within the framework of the Planet Nine hypothesis, some tell a deeper story than others. The most cautious/conservative thing to do then, is to focus exclusively on the (meta)stable objects, which are not contaminated by strong interactions with Neptune. Ok, so these orbits are clustered together — why is that a big deal (i.e., couldn’t they just have formed that way)? In essence, this dynamical structure is puzzling because if left to their own devices, the orbits would disperse on a timescale far shorter than the age of the solar system (due to precession induced upon them by Jupiter, Saturn, Uranus, and Neptune). To give you an example, we can plug in numbers into the above equations, and obtain that while Sedna’s orbit precesses at about 0.15 degrees per million years, 2014 SR349 precesses at 0.8 deg/Myr. Give it a few hundred million years, and the orbits will disband. Therefore, some kind of an external gravitational pull is actively keeping them confined. 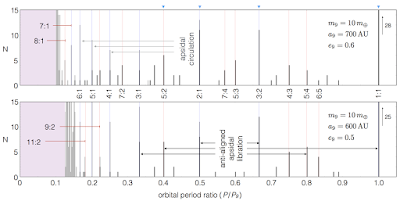 As discussed in numerous published papers (see here for a list (papers that cite BBa)), the above orbital anomalies collectively point to the existence of P9. Nevertheless, to date, the parameters of P9 have remained relatively poorly determined. In the new paper, we went to some lengths to remedy this problem. As an example of the type of calculations we carried out, consider one constraint that comes from matching the critical semi-major axis that corresponds to the transition point between randomized and clusters orbital distributions. In other words, if a planet is responsible for the structure that we see, how does it keep all the orbits aligned, and why does this alignment suddenly “turn on” at ~250AU? The simplest way to understand this analytically is to restrict the orbits to a common plane and to examine the functional form of their gravitational coupling. But to do so without resorting to simulations (which is important if we want to understand the dynamics rather than just model them), we have to rely on the so-called orbit-averaging procedure. Importantly, this expression is the Hamiltonian for the problem at hand, and acts like a stream-function (or a topographic map) for secular evolution of the KBO’s orbit. This means that the long-term changes in the KBO’s orbit will simply follow the contours of the above equation. Neat right? Now, mapping the level curves of this Hamiltonian on a eccentricity vs. longitude of perihelion (relative to P9) plane at different KBO semi-major axes reveals the emergence of a stable equilibrium at ∆w=π for a>250AU. 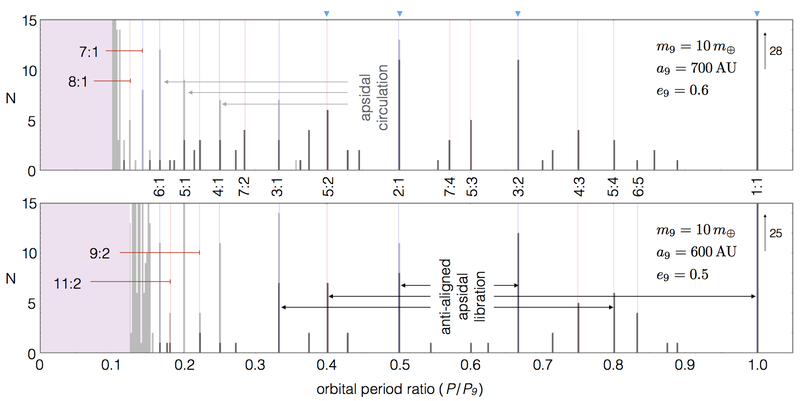 Qualitatively, this is why only distant orbits are clustered — perihelion anti-aligned orbits are only stable beyond a critical semi-major axis, and this value depends on the assumed orbital parameters of P9. 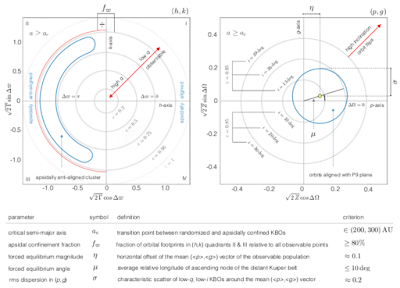 The reason behind why the orbits all cluster to a common orbital plane can also be understood in this manner, but excitation of KBO orbits onto highly inclined/retrograde orbits is considerably more complicated. If you’re interested in learning more, check out section 4 of the manuscript. In section 5 of the paper, we carried out a quantitative comparison between statistical properties of the synthetic data and the real objects for each one of our N-body sims. Intriguingly, it was this analysis that revealed that a comparatively low mass Planet Nine fits the data better than our original estimates for P9 in every respect. If you don’t believe me, feel free to examine the full ensemble of 5 Mearth simulations for yourself in the plot below. In principle, there is so much more that I would like to say, but at this point I think it’s becoming progressively clearer that my coffee supply ran out a couple paragraphs ago, and in an effort to prevent further degradation of the text, I will get straight to the final point: if Planet Nine is smaller, does that mean it's harder to find with a telescope? Counterintuitively, it's the opposite. The smaller distance from the sun more than makes up for the diminished surface area. 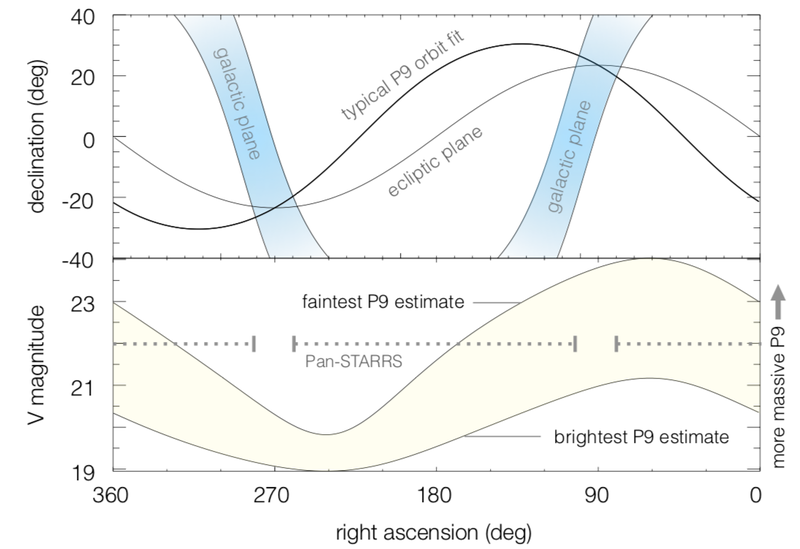 Indeed, if we make naive baseline assumptions about P9’s albedo and adopt the interpolated exoplanet mass-radius relation to estimate P9’s size, Planet Nine turns out to be about one magnitude brighter than we previously thought. Annoyingly, though, the aphelion is very close to (in?) the galactic plane, where confusion due to background stars can readily impede detection. Still, unless we are unlucky and P9 is unexpectedly small and/or dark, it should be within the reach of LSST and comparable telescopes like Subaru. The good news is that in the case of Planet Nine hypothesis, time truly will tell. The history of Le Verrier’s mathematical discovery of Neptune is my favorite story, period. It’s literally got everything you’d want in a good novella - differential equations, integrals, telescopes, intrigue, you name it. Rather than try to rehash it here without doing it justice, I’ll point the interested reader to an excellent 2016 article by Davor Krajnović called “The contrivance of Neptune.” Here, I only want to call attention to what Le Verrier (and Adams) got right and what they got less right. It’s widely known that Neptune was discovered “with the tip of a pen.” Indeed, Le Verrier was able to derive Neptune’s location on the sky from orbital anomalies of Uranus with exquisite accuracy, such that Galle and D’Arrest’s observational campaign to discover this elusive planet took less than a single night. 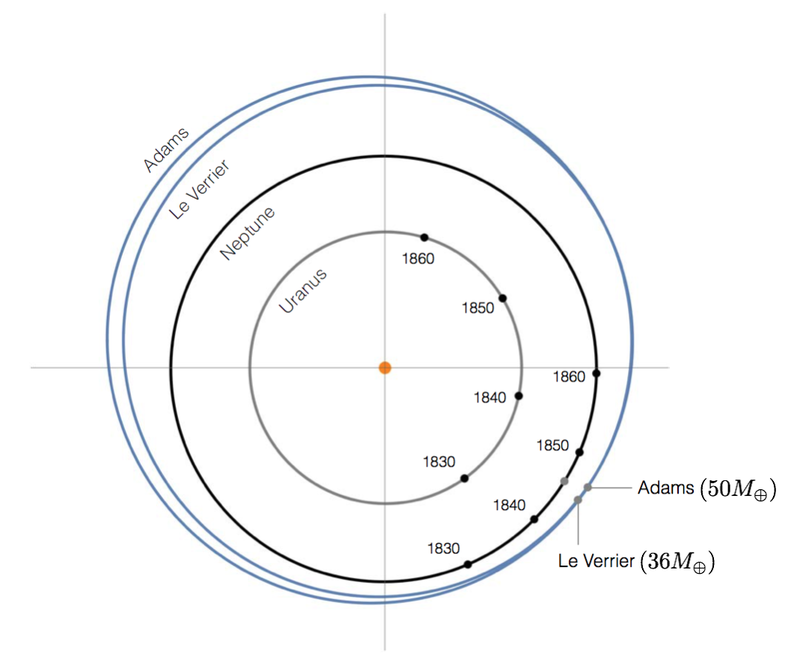 What is somewhat less well known is that Le Verrier and Adams’ calculations of Neptune’s orbit and mass were not as precise. The figure below shows the true orbits and locations of Uranus (gray) and Neptune (black) between 1830 and 1860, as well as the predicted orbits of Neptune (in purple). Notice that the inferred semi-major axis of Neptune was about 40 (rather than 30) AU and the derived mass (36 and 50 Earth masses for Le Verrier and Adams, respectively) also significantly exceeded that of Neptune. 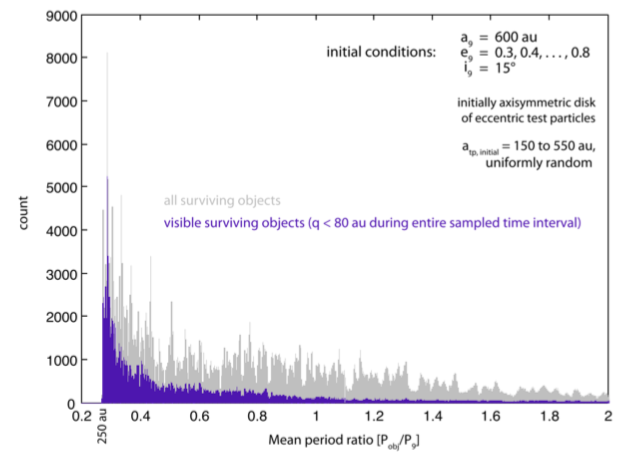 In light of the fact that the discovery of Neptune represents the only successful mathematical prediction of a planet to date, this level of uncertainty sets the gold standard for dynamically motivated planetary predictions. In other words, if we get Planet Nine to a similar level of precision, I’ll be satisfied. It is also useful to point out that the most significant quantity in perturbing the orbit of Uranus was the anomalous acceleration in the radial direction produced by the new body - GM/r^2 - a ratio that was calculated to higher accuracy than the individual values of mass and semi-major axis. As I will highlight later, the general framework of the Planet Nine hypothesis is characterized by comparable degeneracies between P9’s mass and orbital parameters. Following Le Verrier’s mathematical discovery of Neptune, the planet prediction business didn’t simply get a boost - it exploded. Jacques Babinet (1848), David P. Todd (1877), George Forbes (1880), Camille Flammarion (1884), William Pickering (1909-1932) all took turns predicting trans-Neptunian planets that later turned out to not be there. But no planetary prediction is quite as emblematic as Percival Lowell’s hypothesized “Planet X.” Briefly, the story goes as follows: despite the addition of Neptune to the solar system’s ledger of planets, small apparent discrepancies in the orbits of the giant planets remained, and pointed to the existence of a ~7 Earth mass planet beyond Neptune. The search continued well past Lowell’s death, and in 1930, a bright moving object was discovered by Clyde Tombaugh in the approximate location on the sky where Planet X was envisioned to be. Because Planet X was the object of the original search, the newly found body was initially considered to be the long-sought-after Planet X. Immediately, however, there was a problem. Planet X was supposed to be like Neptune, but Tombaugh’s new planet appeared dim and point-like, and therefore much much smaller. It soon became clear that the new member of the solar system could not be THE Planet X. 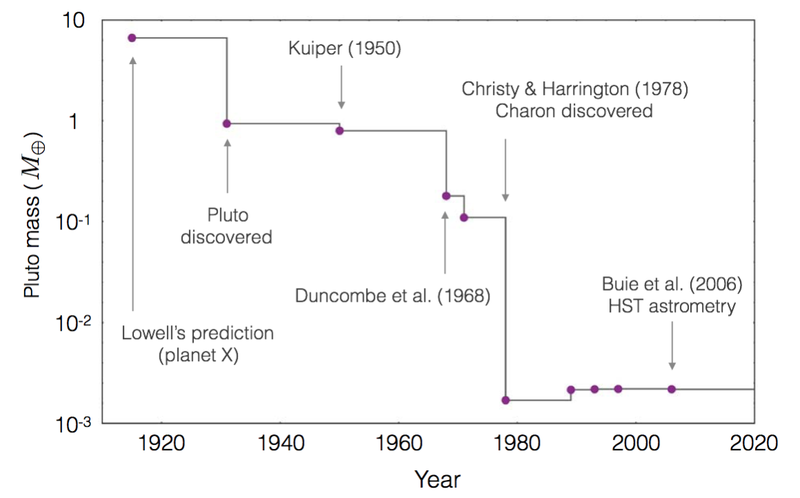 The object was subsequently named Pluto, and its estimated mass steadily declined for the next 5 decades. Remarkably, Planet Nine falls right in the center of that region. The scientific process is, at its core, iterative. There is no such thing as a truly final/definitive answer - there are only solutions that are good enough for now. In a day-to-day sense, what this really means is that when you’ve been chugging away at some problem and you finally arrive at the result, you can be damn sure that you probably haven’t understood the Full Picture (even if in the moment it feels like you have). “Maybe there is a more elegant way to arrive at the solution? Maybe some approximation has introduced a hidden uncertainty? Maybe there’s a better way to look at the data?” Every step in the right direction is inevitably haunted by questions that fall along these lines. The Planet Nine story is no exception to this rule. Back when Mike and I published our first P9 paper three years ago, we didn’t worry that there might be a lot more work to be done on this problem - we were certain of it. Instead, what we worried about was that there exists a simpler, or perhaps more natural resolution to the anomalies we were seeing in the data, and that the Planet Nine hypothesis will be rendered irrelevant shortly after publication. That didn’t happen. To our joint relief (and to some extent surprise), thus far, the P9 hypothesis has fared the test of time rather well. 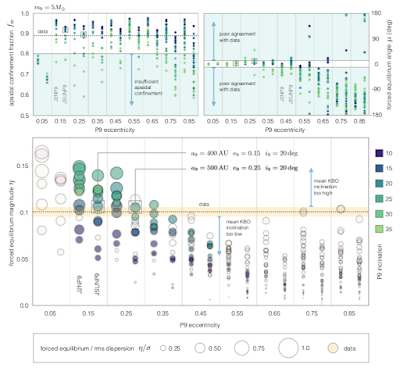 Inevitably, questions have come up regarding the role of observational biases in shaping the orbital clustering we see in the distant Kuiper belt, but these concerns have been largely put to rest. Alternative theories, on the other hand, require the existence of a hidden, coherent, and massive belt of icy planetesimals at hundreds of AU - a scenario that suffers from a number of astrophysical drawbacks. The P9 story thus continues to be in pretty good shape. Nevertheless, we have always felt the need to drive our understanding of the Planet Nine hypothesis a little bit further (and then a bit further after that). 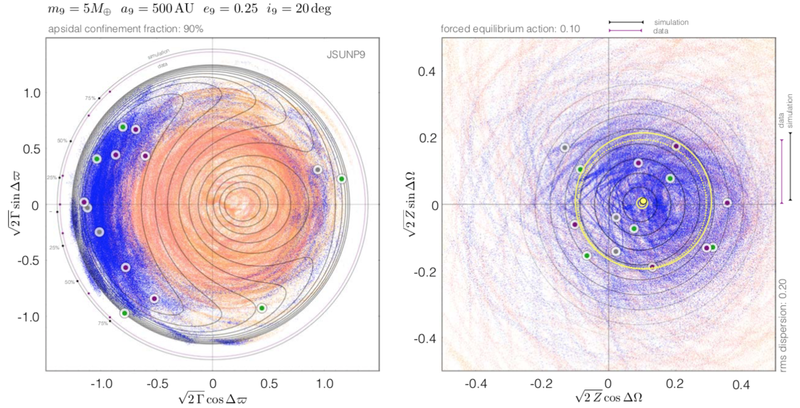 So, in collaboration with Juliette Becker and Fred Adams from University of Michigan (as well as Elizabeth Bailey here at Caltech and Alessandro Morbidelli from Nice observatory on earlier works), we spent the last couple years characterizing P9-induced dynamics from analytical grounds and trying to constrain the mass and orbit of Planet Nine to better precision. 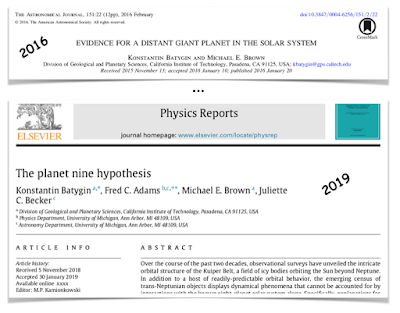 The results of these endeavors are compiled in our new review article entitled “The Planet Nine Hypothesis,” published in Physics Reports today. Admittedly, in writing this manuscript, we ended up erring on the side of completeness over completion, so the paper is not exactly short. As a result, with an eye towards providing an “executive summary” of the results, in the next couple posts, I will highlight some of the main take-away points of the article, beginning with brief historical account of planetary predictions based on dynamical evidence. Is Planet Nine just a ring of icy bodies? We have just passed the three year anniversary of the publication from Konstantin and I on our proposal for the existence of Planet Nine. 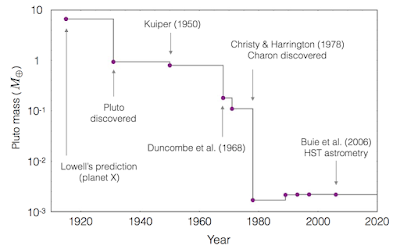 In those three years something remarkable happened: not a single alternative hypothesis was proposed to explain the observed alignment of the distant Kuiper belt objects that led to the hypothesis. Instead, most of the discussion has centered about the critical question of whether or not the alignment is really there or somehow an illusion (the latest and definitive analysis, published yesterday, makes it clear that the alignment is really there). 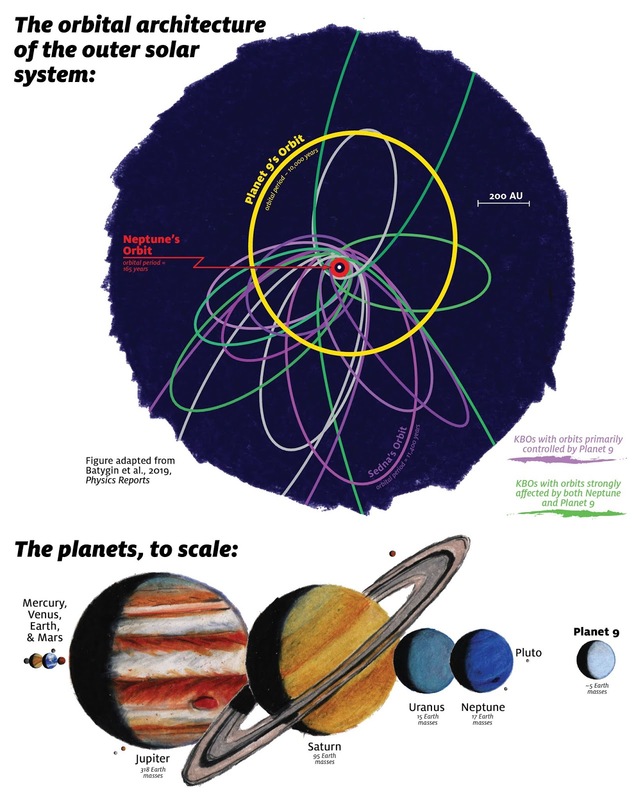 It appeared that if the observations were real, Planet Nine was the only explanation. A lack of alternative hypotheses is unusual. Astronomers are extremely good at coming up with explanations for nearly anything. Usually the problem is too many explanations with not enough data to discriminate between them. The fact that no Planet Nine alternative was proposed for so long was a testament to the fact that it is really really hard to explain the quite good data in any other way. I am happy that there is finally an alternative explanation, even if that alternative is only Planet-Nine-ground-up-into-a-ring. 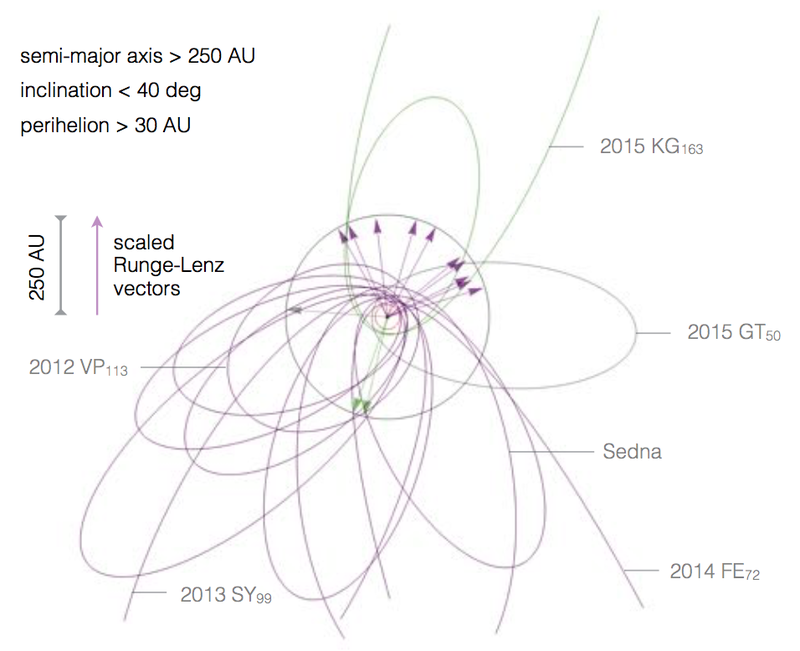 So, is Planet Nine really just an eccentric inclined ring of icy bodies? As happy as I am to see alternative hypotheses, and as correct as I think the underlying physics of this paper is, I think it is utterly unlikely that our solar system has a massive eccentric inclined ring of material. There are two major reasons why this seems somewhere between implausible and impossible to me. First, the ring needs to contain something like 10 times the mass of the Earth. Current estimates of the amount of material in the Kuiper belt are about 100-500 times smaller than that. Could we be wrong by a factor of 100-500? Sure. There are always ways to conspire to hide things in the outer solar system, but that is an awful lot of mass to hide. Second, it is critical to ask: why would there be a massive eccentric inclined ring of material in the distant solar system in the first place? The new paper doesn’t address this question at all. It simply shows that if such a carefully arranged ring is put into place by fiat it can stabilize itself (Konstantin doesn't think such a disk is stable over the age of the solar system, but that's beyond my pay grade; the new paper doesn't realistically address the question so it's hard for me to know) and can cause the same effects that Planet Nine would. But I can’t think of any remotely plausible reason such a disk would be there in the first place. Basically the answer to “why do we see a disk of distant eccentric inclined Kuiper belt objects?” is “because there is a much more massive disk of even more distant eccentric inclined Kuiper belt objects keeping it in place.” To be fair, that doesn’t mean that there isn’t such a disk. There are plenty of things in the universe that we originally thought were implausible that turned out to be true. But it is by no means a simple, natural explanation. The Planet Nine hypothesis, on the other hand, explains the observations and is considerably simpler. One planet, scattered into the outer solar onto a eccentric inclined orbit, explains a host of otherwise unexplainable phenomenon. As breathtaking as the idea that there might be a new planet out there is, the steps to get there are really rather mundane. This new alternative is a much more complicated answer to the same question. Usually in science we prefer the simpler solution. Again, this doesn’t guarantee that it is true, but that there needs to be some compelling reason to believe that the simpler explanation is wrong and the more complicated one is correct. I can’t see any such reason. The good news, though, is that a ring of bodies is significantly easier to find than a single planet. While I would argue that it should already have been found it it existed, at least we can all agree that something remains out there to be found and that continued exploration of the outer solar system is the key to unraveling what is going on out there. Greetings! My name is Elizabeth Bailey, and I am a graduate student here at Caltech. As part of my work so far, I have addressed the ongoing search for Planet Nine, in particular the use of mean-motion resonances to infer its present-day location on the sky. A mean-motion resonance occurs when two bodies orbiting a central body have orbital periods related by an integer ratio. A great example is Pluto and Neptune. 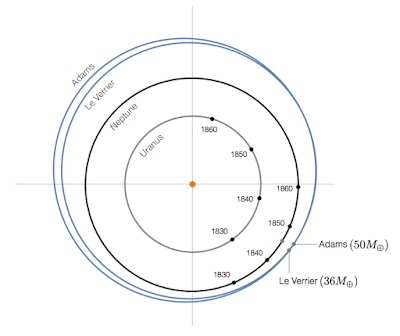 Pluto’s orbit is not a perfect circle, but rather a little elongated (e ~ 0.25). It actually crosses Neptune’s orbit, which might lead one to ask if they are on a collision course with each other. Fortunately, the answer is a confident “no.” Neptune and Pluto will never collide, because they are in a 3:2 (pronounced “three-to-two”) mean motion resonance with each other. Meaning, for every three trips Neptune completes around the sun, Pluto completes exactly two. It’s as if they’re dancing with each other. Every three times Neptune steps into the intersection of their orbits, Pluto steps twice somewhere else, and they don’t step on each other. 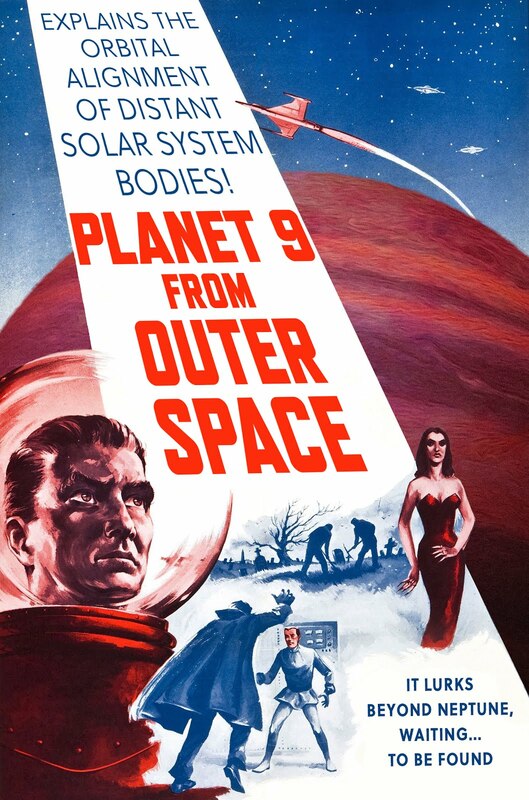 So what does this have to do with Planet Nine? If Planet Nine exists, the distant KBOs it shepherds may very well experience resonant interactions with it. In fact, this was already pointed out in Konstantin & Mike's original Planet Nine paper, and is at this point relatively well understood. As a result, we can reasonably expect that at least some of the observed KBOs are currently locked into resonances with Planet Nine, and if we can understand the machinery of these interactions, perhaps we can infer the location of P9. In a sense, the distant solar system is a lot like a giant cosmic nightclub. In this analogy, we are scanning the dance floor for Planet Nine, but it's hanging out in a dark corner somewhere in the back, while everyone is doing a P9-themed dance. So rather than looking for P9 itself, we are instead trying to figure out where it is by studying the KBO mosh-pit. This brings us to the key problem at hand: is this feasible in practice? We address this question in our recent work, published in the Astronomical Journal. The takeaway point from this figure is that although you do find a lot of KBOs at the big-name resonances like 3:2 or 1:1, there are many objects occupying other resonances with larger integers in their names, like 14:5 or 2:7. 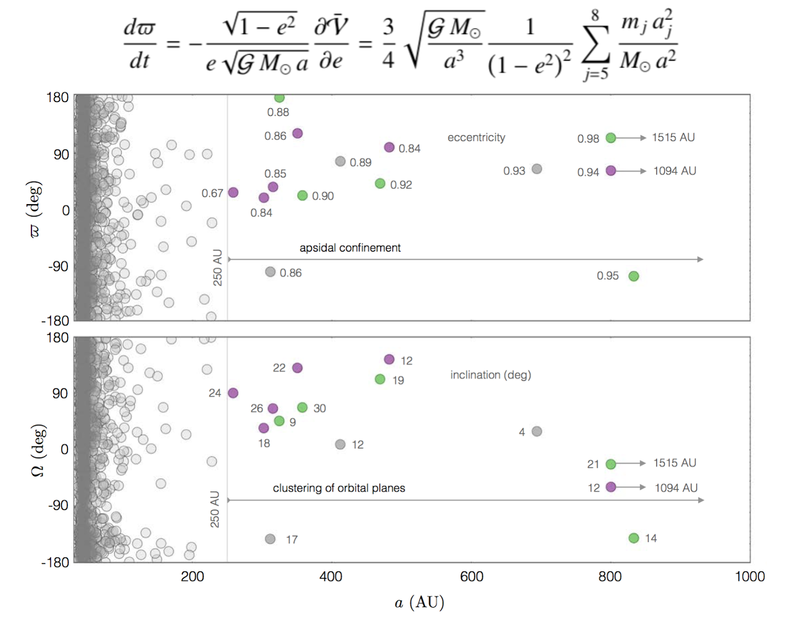 There is a disturbing consequence of the mathematical nature of the planetary disturbing function (yes, it is actually called "The Disturbing Function" in celestial mechanics literature) which, upsettingly, suggests that these so-called high-order resonances become increasingly important when dealing with eccentric planets like Planet Nine, and the results of computer simulations presented in this work confirm this. In summary, because Planet Nine is eccentric, it carries out very complicated dance moves with the KBOs. It's worth mentioning that the simulations used to make this figure were simplified in comparison to reality. The canonical giant planets Jupiter through Neptune were treated as a static ring of mass (this is often referred to as the “secular” approximation), and the solar system is treated as a flat 2-dimensional object even though Planet Nine is, in reality, inclined. Think of it as a best-case scenario of sorts: in this physical setup, Planet Nine is the only active perturber of the KBOs. In the real solar system, Neptune is also on the dance floor, behaving in a very disruptive fashion. When KBOs get too close to Neptune, it flings them around. Sometimes those KBOs resume dancing with Planet Nine, but other times they just head out the door into interstellar space. Suppose, despite these complications, you could determine which individual KBOs are indeed in mean motion resonances with Planet Nine at this time. Then, if this information were to be of any use, you would then need to know the specific resonance of each KBO. In 3-D simulations, there is no obvious concentration of objects at particular resonances (see figure below). Hence, no matter how long we wait for more KBOs to be observed, we have virtually no hope of using resonances to predict Planet Nine's current location along its orbit. 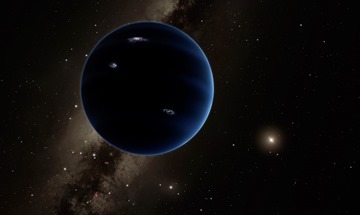 Although based on the results of this work it does not appear feasible to predict the present-day location of Planet Nine along its orbit, this does not by any means imply that Planet Nine is invisible to telescopes. There is still a well-defined swath of sky in which the search for Planet Nine continues. We have merely shown that mean-motion resonances with KBOs are not a useful tool for deciding where point the telescope, so we're back to systematically scanning the sky. Turns out that even in astronomy, the easy way is the hard way. Hi, everyone! I’m Tali, an undergrad at the University of Michigan. 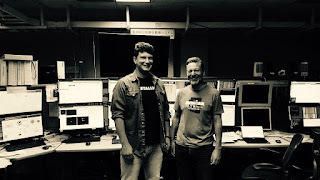 Last summer, I worked on a Planet Nine project with Konstantin and Mike, and although we didn’t find Planet Nine (yet! ), we did look further into the stability of objects in the presence of Planet Nine. Turns out, not everything is stable! In his last post, Konstantin explained that the main cluster of anti-aligned objects is able to remain stable due to mean motion resonances with Planet Nine. Their orbits always cross Planet Nine’s orbit, but such resonances allow the objects to avoid collisions. Here’s an example of what the dynamics looks like: the green orbit is Planet Nine, and pink orbit is an anti-aligned Kuiper belt object. The little blue circle is Neptune’s orbit, and the star is the Sun (not to scale). What we see here is that the anti-aligned object experiences librations (=bounded oscillations) in the direction its orbit points (the longitude of perihelion). Meanwhile, Planet Nine’s orbit slowly precesses and changes direction as well. BUT, it turns out that being in resonance with Planet Nine is not enough for stability. That’s because Neptune is still in the picture. Let’s look back at the animation above. Notice that as the pink orbits wags back and forth, its perihelion distance (=the shortest distance from the orbit to the Sun) changes. The pink orbit stretches (and hugs Neptune’s orbit) and then circularizes (and detaches from Neptune). The wider the “wagging the tail” oscillations are, the more pronounced the in and out behavior becomes. If the object librates with too large of an amplitude, it comes suuuuuper close to Neptune. And when that happens, it either gets ejected from the solar system or its dynamics changes entirely, and its behavior is no longer relevant to Planet Nine. SO, the stability of the anti-aligned objects can be summarized by the two gifs below. When the longitude of perihelion libration (tail-wagging) is mild, our object experiences small changes in perihelion distance, and thus remains at a safe distance from the inner solar system. But, if the librations become too wide (and too wild), the object goes unstable, thanks to Neptune. As you can see this object is in the perfect stable location - it stays far away from Neptune (blue) AND doesn’t cross Planet Nine’s orbit, and just quietly librates in longitude of perihelion. This object is all set for life. Nothing will make it budge from this configuration. So, what’s the bottom line? Not all anti-aligned objects are stable! And not all aligned objects are stable. And it all depends on their perihelion distance, which is closely tied with their librations in longitude of perihelion. Moreover, it turns out that what kind of objects we find surviving through the end of our simulations depends on the initial conditions we put in. What do I mean by initial conditions? Well, for example, we expect that different scenarios of Planet Nine’s formation would have affected the initial configuration of the Kuiper belt in different ways. So, suppose we start with two different initial conditions: a “narrow” Kuiper belt (objects initially within a narrow interval of perihelion distances) and a more widely spread “broad” Kuiper belt. And now we integrate these populations forward, in the presence of Planet Nine, in two separate simulations. Do these populations end up creating the same Kuiper belt? 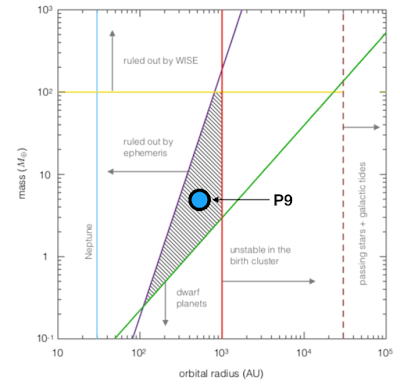 Read our paper here to find out more about Planet Nine, initial conditions, and stability! Every die-hard fan of the scientific method knows that Karl Popper was a baller. While his achievements clearly extend far beyond analysis of the scientific method alone, he is arguably best known for his work on empirical falsification. In essence, the idea behind his argument is that a theory is only any good if there exists a direct and clear experimental/observational way to demonstrate that it is incorrect. In other words, it is more important to point out avenues in which your theory can be wrong than to flaunt all the possible ways it could be right. Why am I writing about this? Mike and I just spent a week at 14,000ft on the Big Island directly searching for Planet Nine, and I’ve been thinking a lot about how Popper’s falsifiability criteria apply to the Planet Nine hypothesis… Obviously, if we search the entire sky at sufficient depth and don’t find Planet Nine, then we are plainly wrong. But I don’t think this is going to happen. Instead, I think we (or some other group) are going to detect Planet Nine on a timescale considerably shorter than a decade - maybe even this year if we/they get lucky. Which begs the question: if a planet beyond Neptune is found, how would we proceed to determine that the Planet Nine theory is actually right? Figure 1. Mike and I at the telescope - where colors don't exist. I’m sure this question sounds incredibly stupid, so let me back up a bit. 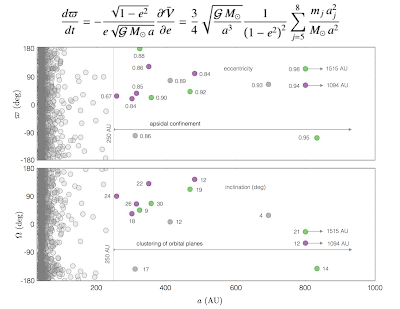 The Batygin & Brown 2016 AJ paper is by no means the first to predict a trans-Neptunian planet with a semi-major axis of a few hundred astronomical units. That accolade goes to George Forbes, who in 1880 proposed a planet located at ~300AU, based upon an analysis of the clustering of the aphelion distances of periodic comets (sound familiar?). Since then, a trans-Neptunian planet has been re-proposed over and over again, which brings us to problem at hand: whose trans-Neptunian planet theory is right and whose is wrong? In my view, there is a very clear and intelligible way to answer this question. Each proposition of a trans-Neptunian planet is uniquely defined by (i) the data it aims to explain and (ii) the dynamical mechanism that sculpts the observations. So in order to be deemed correct, the discovered planet must match both of these specifications of the theorized planet. Figure 2. The current observational census of distant KBOs. When it comes to the Planet Nine hypothesis, point (i) is well-established: Planet Nine is invoked to explain (1) physical clustering of distant Kuiper belt orbits, (2) the perihelion detachment of long-period KBOs such as Sedna and VP113, as well as (3) the origin of nearly-perpendicular orbits of centaurs in the solar system. Embarrassingly, until recently our understanding of the “machinery” behind how Planet Nine generates these observational signatures has been incomplete. 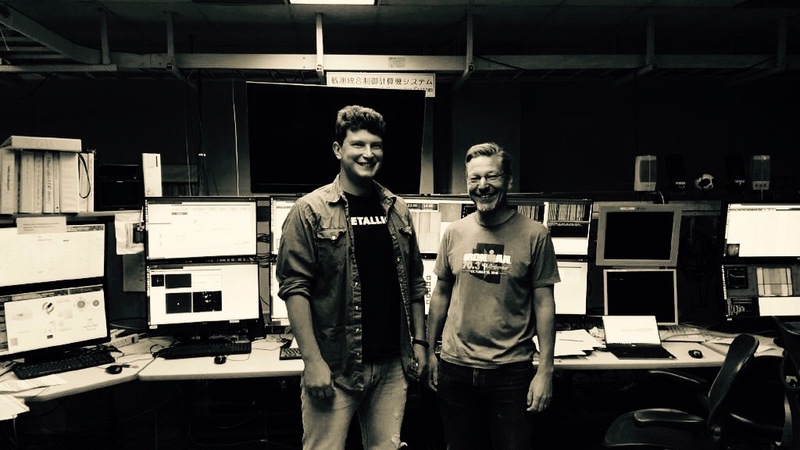 That is, although we have plenty of numerical experiments to demonstrate that Planet Nine can nicely reproduce the observed solar system, the theory that underlies these simulations has remained largely elusive. The first lingering question that Morby and I tackled is that of stability: how do the distant Kuiper belt objects avoid being thrown out of the solar system by close encounters with Planet Nine, when their orbits intersect? Turns out, the answer lies in an orbital clockwork mechanism known as mean motion resonance (MMR). 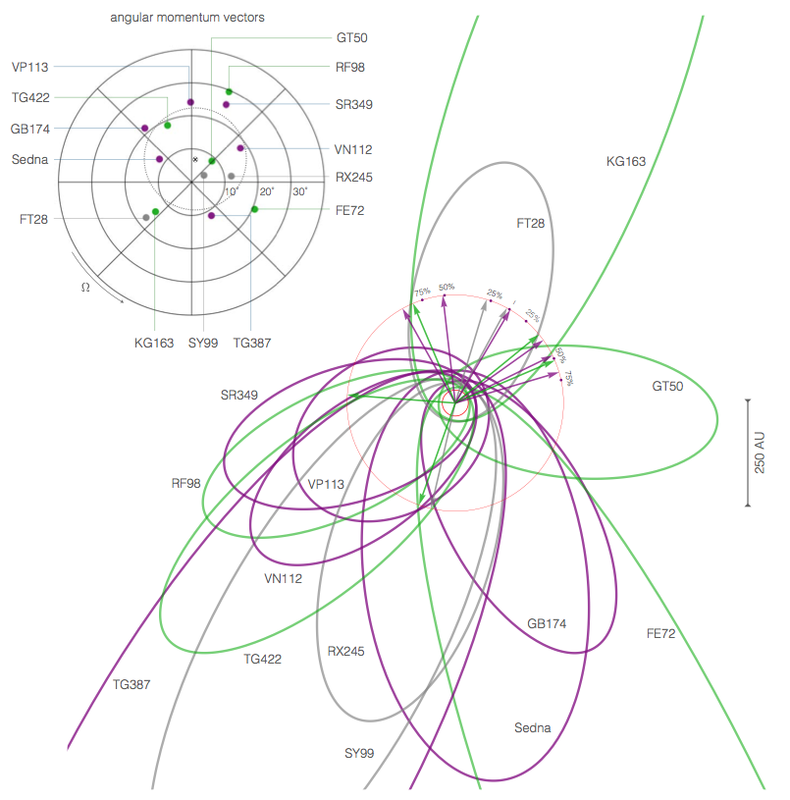 When a Kuiper belt object is locked into an MMR with Planet Nine, it completes an integer number of orbits per (some other) integer number of orbits of Planet Nine. This strict rationality of the orbital periods allows the bodies to exchange orbital energy in a coherent fashion, and ultimately avoid collisions. Figure 3. 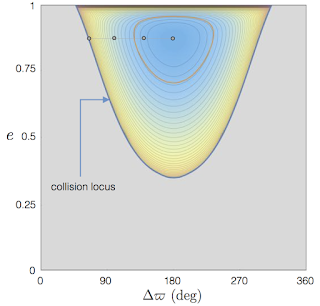 Orbital distribution of long-term stable KBOs in an idealized P9 simulation. All of this said, the full picture is of course not as clear-cut. Within the context of our most realistic calculations of distant Kuiper belt evolution, the clustered KBOs chaotically hop between resonances, instead of staying put. 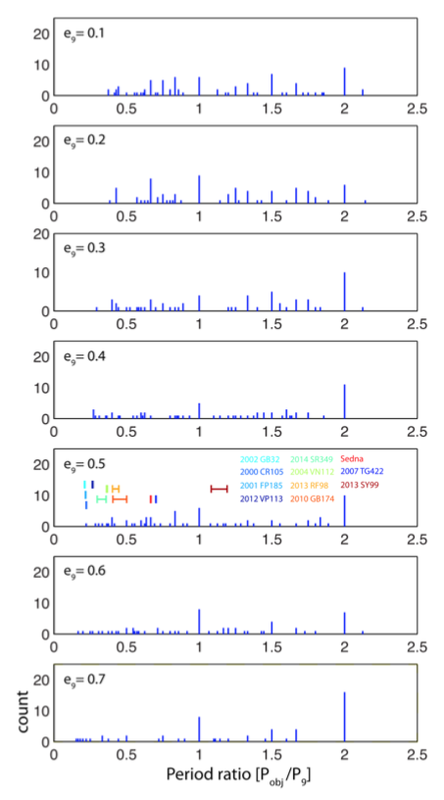 Still, the qualitative framework provided by analysis of isolated resonances holds well, even in our most computationally expensive simulations. Ok so this resolves the question of how Kuiper belt objects survive, but it leaves open the question of why their orbits are clustered together. Intriguingly, a qualitatively different dynamical mechanism - known as secular interactions (see here for a neat discussion) - is responsible for the orbital confinement that we see. Plainly speaking, over exceedingly long periods of time (e.g. 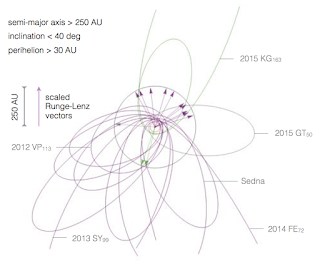 hundreds of orbits), Planet Nine and the Kuiper belt objects it perturbs will see each-other in almost every possible configuration along their respective orbits. Thus, their long-term evolution behaves as if the mass of Planet Nine has been smeared over its orbital trajectory, and its gravitational field torques the elliptical orbit of the test particle. 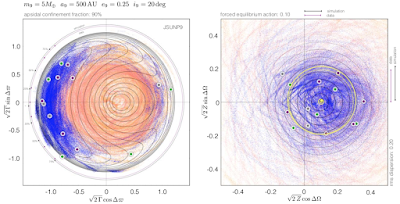 The plot below shows the eccentricity-longitude of perihelion portrait of this secular dynamic inside the 3:2 mean motion resonance, where the background color scale and contours have been computed analytically and the orange curve represents a trajectory drawn from a numerical simulation. Figure 4. 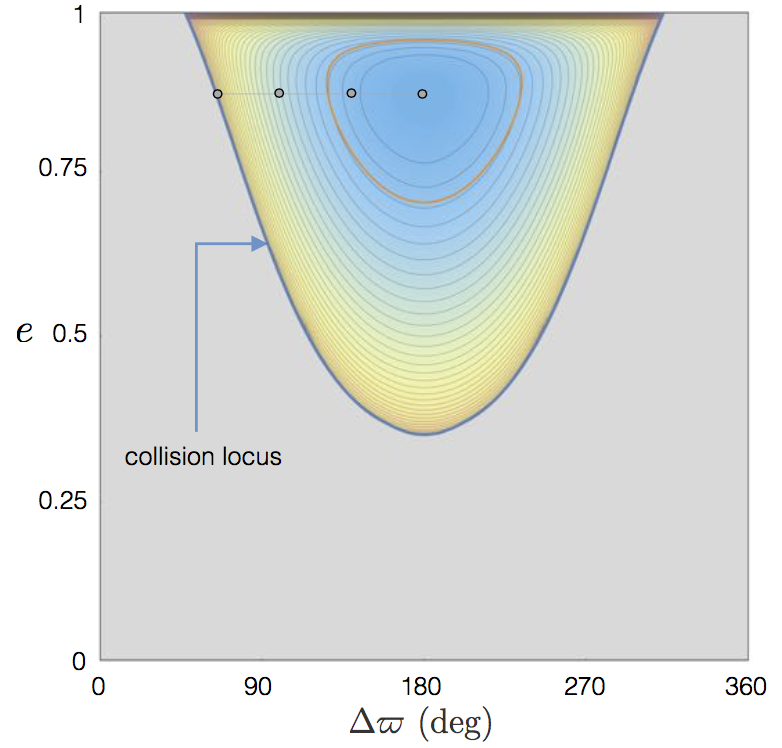 Eccentricity-perihelion diagram showing the secular trajectories of stable KBOs trapped in a 3:2 MMR with P9. Indeed, the fact that the semi-analytic theory predicts looped trajectories that cluster around a P9 longitude of perihelion offset of 180 degrees implies that the raising of perihelion distances (i.e. 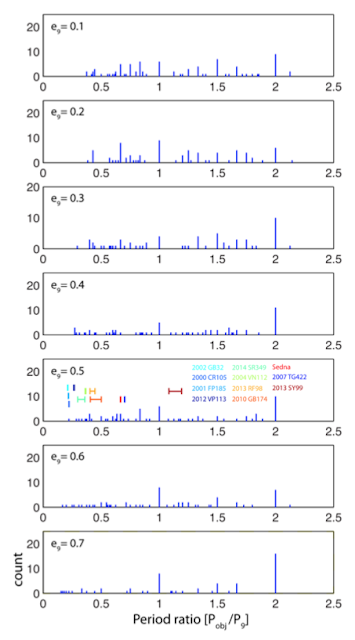 lowering of eccentricities) of long-period KBOs and anti-aligned orbital confinement are actually the same dynamical effect. In other words, the reason that objects such as Sedna and VP113 have orbits that are not attached to Neptune is because they are entrained in the peculiar anti-aligned secular dynamic with Planet Nine. Finally, there is the puzzle of the highly inclined orbits. Whenever one sees cycling of orbital inclination and eccentricity, there is a temptation to invoke the Kozai-Lidov mechanism as the answer. In the case of Planet Nine, however, the high-inclination dynamics are keenly distinct from those facilitated by the Kozai-Lidov effect. 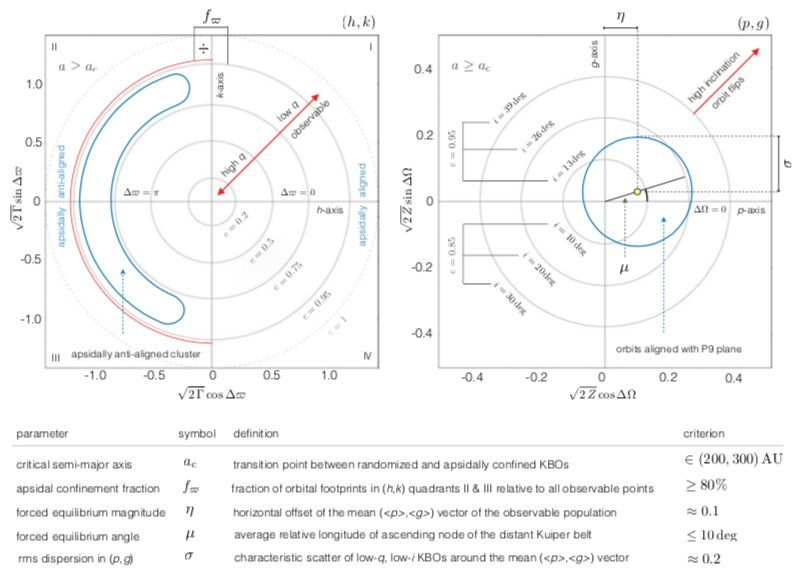 Perhaps the most obvious reason why the dynamics we observe in numerical simulations is not the Kozai-Lidov effect is that in our calculations, highly inclined KBOs develop the highest eccentricities when their orbits are perpendicular to the plane of Planet Nine’s orbit, in direct contrast with perpendicular and circular orbits entailed by the Kozai-Lidov effect. So if it’s not the Kozai-Lidov resonance, then what is it? 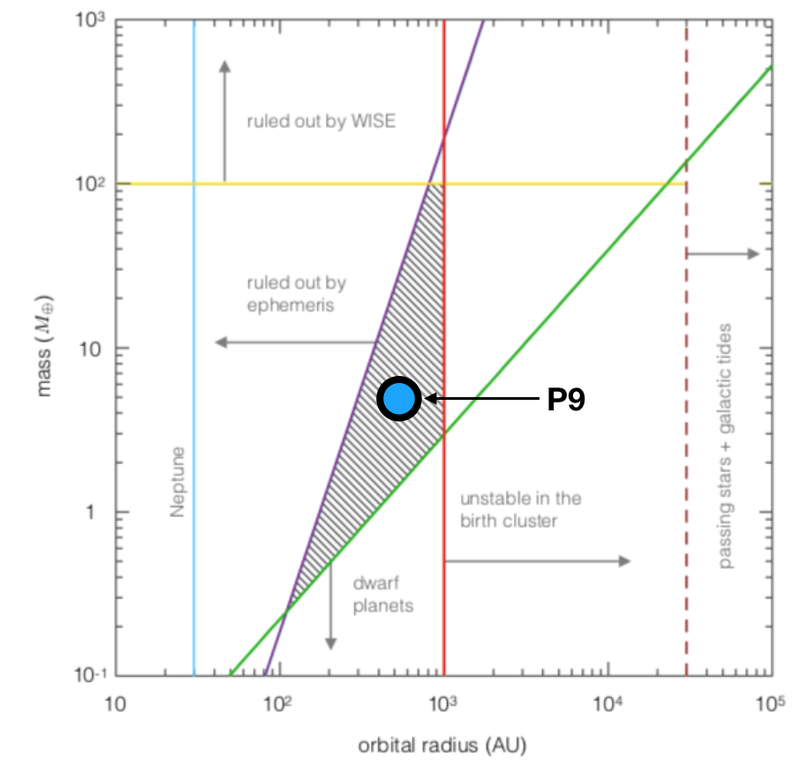 As it turns out, the high-inclination dynamics induced by Planet Nine is characterized by the bounded oscillation of a octupole-order secular angle which is equal to the difference between the longitude of perihelion of the KBO relative to that of Planet Nine and twice the KBO argument of perihelion. 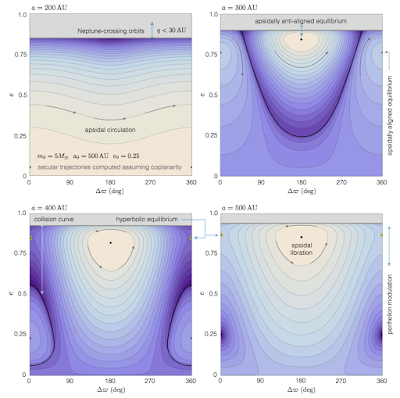 How could we have ever thought it was anything else?… The plot below shows the high-inclination secular resonant trajectories executed by test-particles in our simulation plotted in canonical action-angle coordinates, with the observed objects shown in orange. Examining this plot closely, one detail that I’m reminded of is the fact that the few high-inclination large semi-major axis centaurs that we know of are actually the “freaks” of the overall population, since they all have perihelia on the order of ~10AU. Certainly, detecting a sample of these objects with perihelia well beyond 30AU would be immensely useful to further constraining the parameters of the model. Figure 5. High-inclination dynamics, depicted in action-angle variables. With the above rambling in mind, I will admit that all I’ve mentioned here is an introductory account of the paper. 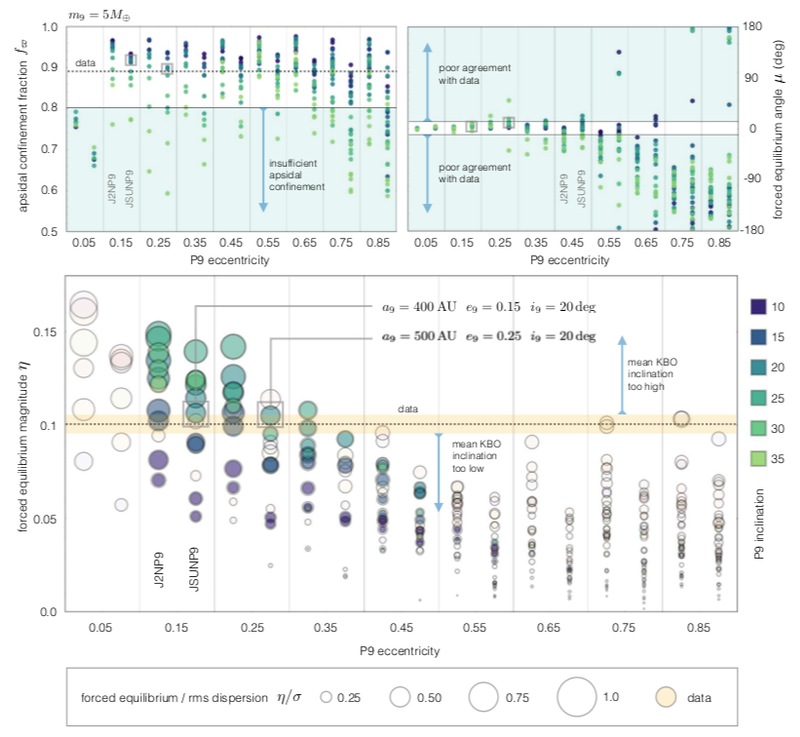 As such, it represents a considerable simplification of our actual calculations, so if you want to better understand the full picture, I can only urge you to read the paper itself. 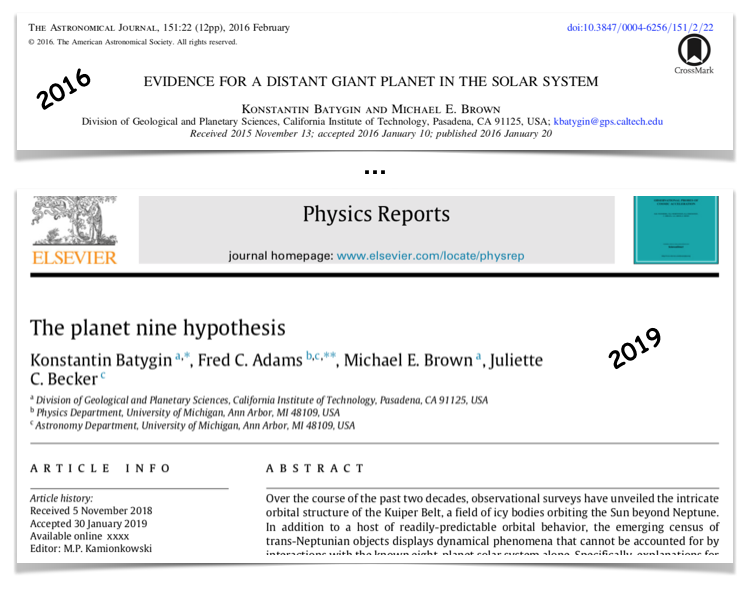 Importantly, however, the work presented in this manuscript not only provides us with a better understanding of how the observed census of distant KBOs has been sculpted by Planet Nine, it finally places the P9 hypothesis within the framework of Popper’s demand for falsifiability, and sincerely allows for the confrontation of the Planet Nine theory with the observational search. The final step is now to find it.